With the ongoing concern about the Solid Waste Management within the Ward 2 area, the Ward 2 Forum in conjunction with the Transformation Committee, other member organisations and concerned residents of the area have monitored the Genadendal Landfill site on a periodic basis. The situation of Solid Waste in the Ward 2 area has worsened particularly over the last 8 months. Waste volumes have increased and the management thereof reduced. Ward 2 Forum submitted to the Local authority a full Viability Report on this with proposals in March 2016, after the debacle of the proposed Solid Waste drop-off at the entrance to the Greyton Village. This was not the first time though as a similar Project Presentation Report was submitted in 2008/9 by Derek Crabtree and George Juries to TWK through the then Ward Committee (Caroline Wood being the councillor at that stage). The area contaminated has grown substantially, with still no fencing of the area to assist in curbing the pollution of the surrounding area by windblown plastic and paper and the keeping out of those Animals roaming and rummaging through the waste. See Videos below showing the current situation. Yet, the oxidation ponds in Greyton have partial fencing topped with razor wire. A concerted effort is now urgently required by all interested and affected parties. The Ward 2 Forum is currently engaging with Province and Boetie Bantam to assist in finding a workable, viable and sustainable solution for the Sorting and Recycling (S&R) of Solid Waste for the Ward 2 area. The legislative requirements are prohibitive in starting a large scale project but allows for smaller projects to be operated without having to go through the prescribed EIA, scoping and application exercise. 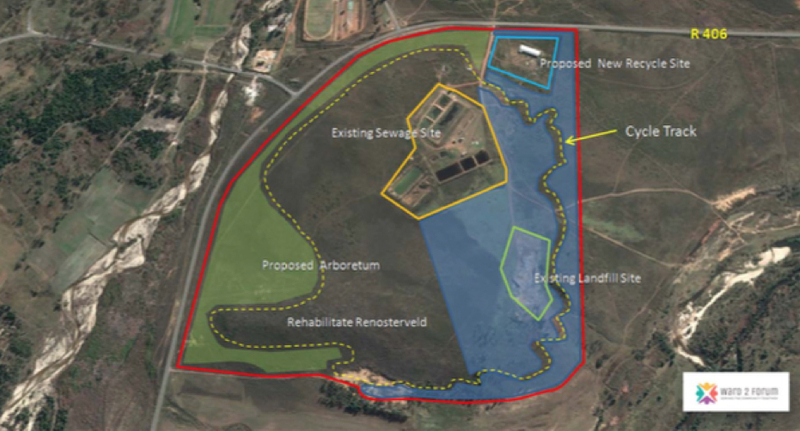 Our problems are compounded by the fact that both the Greyton and Genadendal Landfill Sites, in terms of the Waste Management Licence (WML) granted to TWKM on the 14th November 2014, are scheduled to be decommissioned by the year 2019. The WML for the closure of the Facility by TWKM was submitted as part of the final Basic Assessment Report dated 1 April 2014, and must be implemented together with all the conditions stipulated. For which there is, we believe, no budget for any of the requirements. Future waste should be sorted rather than disposed of. Waste salvaging should be reconsidered as a possible way of reducing the existing waste volumes. The fence should be erected but allowing easy access by the community to the facility at all times, otherwise illegal dumping may increase in the area. The rehabilitation of the site must be done with local indigenous plants. And much more – rebuilding of the pipe culvert over the Scholtz, security system (gate and attendant), construction of a disposal cell including clay liner and engineered drainage, monitoring of ground pollution at specific boreholes. For this to be achieved we, the Ward 2 Forum, invite all individuals, organisations and associations to assist in a participatory process to find workable solutions to the ever increasing challenge of Solid Waste management in our area. A very positive project that would require the assistance of a specific and specialised group of individuals from our area is the Landcare Initiative being championed by the Department of Agriculture of the Western Cape Provincial Government. The Ward 2 Forum was invited to be part of the Transformation Committee delegation to attend the inaugural Plenary Workshop session held at Gabrielskloof. The Landcare initiative is an Areawide Planning methodology that aims to include all role players and affected parties and will remain a community-based initiative. Additional information on this will be published on the Ward 2 Forum platform. Most Greytonian prefer to pay tribute to the three monkeys… “see nothing, say nothing and hear nothing”. Is that the way forward? Of course not! And so, there are those who battle to change things and as a thank you for their dedicated work get spat upon in the face and are insulted, even booed at times I suppose. Who laughs and mocks us? TWK management! Why can we not unite ourselves and divide TWK management?